Paul D. Hanson is the Florence Corliss Lamont Research Professor of Divinity at Harvard Divinity School where he has taught Old Testament for over forty years. In 1970, Hanson received a PhD from the Department of Near Eastern Languages and Civilizations at Harvard University. Hanson is the author or co-author of several books and a number of noted Old Testament commentaries, including Isaiah 40-66 from the highly acclaimed Interpretation series, 2 Chronicles: A Commentary from the esteemed Hermeneia series, Political Engagement as Biblical Mandate, The People Called: The Growth of Community in the Bible, and many more. Most recently, with the release of A Political History of the Bible in America, Hanson has provided a substantial investigation into the religiopolitical relationship that permeates American civilization. A Political History of the Bible in America is a massive volume that leaves virtually no stone unturned. Still I must admit at the outset of this review that I am by no means an expert or specialist on American politics, nor American history. At best one could classify me as an interested spectator in a culturally familiar game. But, then again, this makes me a somewhat interesting candidate to do a review on a book of this magnitude. Hanson begins with a lengthy prologue in which he builds a workable framework for the road ahead, and constructs a compelling case for the overall aim of the book. Hanson explains, “Biblical history, enriched by many religious and cultural traditions, flows into and is intertwined with our nation’s epic, both for better and for worse. To ignore that history is to cut ourselves off from our roots and to deny the ancestral experiences that forged our individual and collective identity” (p. 23). 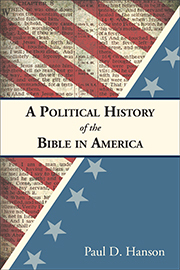 It is here that A Political History of the Bible in America divides into two major parts: (1) a historical retrospective on the relation between the Bible and politics in the United States, and (2) politics in the Bible. In part one, Hanson traces the history of America back to the colonial times, starting with the theocratic model of the Puritans, paying close attention to the role of biblical tradition in the development of the national story of the United States. Hanson summarizes this objective, writing, “our objective is to examine the relationship between religion and politics in US history and identify the theo-political models that were adopted and developed to shape that relationship” (p. 29). As a nonspecialist, I found this section to be both clear and compelling. Hanson quickly drew me into the historical portrait that he was painting. Nevertheless, I found myself wanting more as I entered into the following section. This is largely a result of the brevity of the first part, but also due to Hanson’s ability to pull the reader into the details of the story. In part two, Hanson directs the reader’s attention to the biblical framework in which the political underpinnings of American life have developed. To call this section a detailed study would be a minor understatement at over 500 pages. Hanson surveys both the Old and the New Testament in chronological order and presents a comprehensive study of politics in the Bible. I found this section to be rich with interpretive insight, especially when it involved discussion of the Old Testament Prophets. It is clear that Hanson is in his stride here. Another notable section was the lengthy chapter on the politics of Jesus, where Hanson aims to entertain the historical Jesus conversation and political implications of such simultaneously. Finally, the expedition comes to a close, as Hanson considers the proper methodological approach of biblical interpretation for the changing landscape of contemporary American culture. As mentioned above, I am not a political enthusiast nor an expert on American history. Still, I find both to interesting and intriguing for various reasons (hence, the desire to read and review this book), and inevitably I engage in both on a daily basis as an American citizen. Overall, Hanson has provided a fascinating and compelling study of the religiopolitical relationship in America and beyond, and I appreciate his effort in writing an accessible volume that can be enjoyed by readers of all educational backgrounds. I think that some readers will unavoidably disagree with Hanson’s interpretive method of the biblical text, but they should still be able to appreciate the biblical and theological lenses in which he wears. If you’re even slightly interested in submerging yourself into the world of American politics, then I would highly recommend finding a place for A Political History of the Bible in America in your library. It’s well worth the investment.